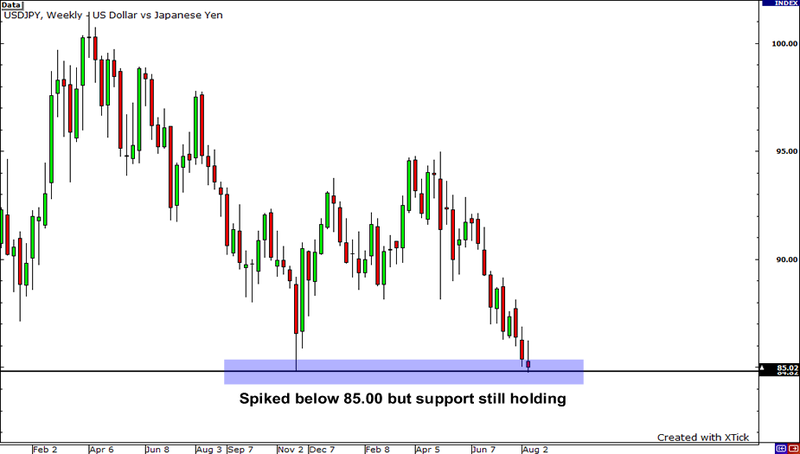 Yen – The New King On The Hill? One day. That’s all it took for market sentiment to shift in favor of the yen. Is this the reversal that the gloom and doom camp has been waiting for? Is risk aversion back in vogue? Yesterday, the combination of disappointing Chinese data and the Fed’s announcement to buy more Treasuries caused risk trades to come off, sending the yen roaring across the board. USD/JPY, for one, posted a new 15-year low at 84.73 before retracing back above the 85.00 handle. While the strengthening yen is good news for the bulls, its effect on the Japanese economy is completely the opposite. For starters, Japanese exporters won’t be singin’ The O’Jay’s “For The Love of Money” if the yen continues to appreciate. Having a highly export-related economy, Japan’s export prices are extremely sensitive to the yen’s fluctuations. An appreciating yen would make Japanese goods less competitive, because those goods would become relatively more expensive than those of competitors. There’s also the big D-word. That’s right – I’m talking about deflation. The Japanese economy might suffer more scars in its battle against deflation if the yen continues to dominate its counterparts. You see, an adverse effect of falling demand for Japanese exports is that it would keep prices from rising. And since Japanese is currently suffering from falling prices (deflation), this ain’t a good thing. Hah, “some sort of action” he says? Sounds like currency intervention threat to me! Ahhhh… intervention… For the longest time, the word on the Forex grapevine has been that the Bank of Japan will NOT allow the yen to appreciate much further. And for their part, Japanese officials have been doing their due diligence. Recently, the government conducted a survey of 200 of the biggest Japanese exporters, asking them how the strong yen has been affecting their profits. The last time the central bank intervened in the markets to weaken the yen was way back in 2004. Since then, the BOJ has merely resorted to verbal taunts and trash talking to help weaken the yen. Besides, it’s not like the BOJ can move the markets by its lonesome. They would need some help from their counterparts at the US Fed and who knows how cooperative Ben Bernanke and his gang will be. So for now, it’s starting to look like that magical 85.00 level may soon break. With the reversal of carry trades dominating the markets and clear-cut intervention seeming like a distant illusion, we may continue to see the yen slice and dice its way across the board in the meantime.